Since the coming of Hard Rock/Glam Metal to the northern countries of Europe, changing the axis of the genre from USA to Finland and Sweden, things became pretty interesting for the fans. The old and rebel genre gained a new energy along some pretty new elements. 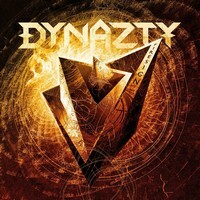 And from Stockholm comes the quintet DYNAZTY, and their latest release, “Firesign”, is really an amazing piece of music. For those who know their work since their beginning, it’s not a surprise to see a band with a melodic and charming worked based on the Glam Metal/Melodic Rock from the 80’s evolving. But this quintet migrated to something that is crude and hard more and more since those days, even with fine keyboards parts, and all without losing their identity. They still bear excellent melodies, fine and hooking choruses, but it is becoming into something modern and heavier. And it’s different from the usual. May the difference is done on the album’s sound production. Thomas “Plec” Johansson made a great work on the production, having Peter Tätgren (yes, the vocalist/guitarist from HYPOCRISY) getting along with Jonas Kjellgren on the mixing. It sounds clear and with that melodic atmosphere of the Melodic/Hard Rock bands from the past, but bearing modern instrumental tunes, along with an excellent level of clarity on the final result. Yes, it’s amazing, indeed. We can say that “Firesign” is on the peak of their creative power by now, and their finest shots are “Breathe With Me” and its mix of charming melodies and aggressive moments (fine vocals and excellent guitars), the crude atmosphere of the nasty “In the Arms of a Devil” (very good work from bass guitar and drums, and what a great chorus), the excellent catchy melodies and harmonies from “My Darkest Hour”, the 80’s Melodic Rock songs “Ascension” (it really brings back to our minds that same feeling from 1985 and 1986 bands from USA) and “Firesign” (this one bears excellent modern tunes on the guitars), the outstanding melodies that hook us of “Closing Doors”, and… Oh, come on, listen to all songs! This album really deserves to be enjoyed at its fullest, and you won’t regret the experience. DYNAZTY’s guys really did a great job, so “Firesign” is here to set your ears on fire.